My school recently started the process of implementing a new instructional model. At the heart of this model is Howard Pitler and Bj Stone’s book A Handbook for Classroom Instruction That Works. Developed from the work of McREL and Robert Marzano, the book unpacks the different facets involved in embedding a culture of instruction. This then is the first of a series of posts covering my own reading, with this one looking at learning objectives and feedback. For before anyone can address the act of instruction, it is essential to set up an environment in which learning can occur. The first chapter addresses the question of why in regards to the environment. The authors make it clear that learning objectives are essential for efficiency and understanding. Specific, but not restrictive, on learning, rather than activities, objectives are the why which drives instruction. They allow for a sense of narrative, connecting with previous and future learning. Made visible to both students and parents, via a workbook, on a whiteboard, as a poster or through a website, objectives provide the means to continually remind and reiterate on the intent. Such objectives though do not necessarily have to always be set for students, with the creation of personal objectives providing an opportunity to build intrinsic motivation. Such personalisation includes using a KWL to identify what students know and want to know or providing a range of choices while staying true to the original objective. One of the catches with objectives is that they can take on many shapes and sizes. Whether it be the big ideas and enduring understandings offered thought Understanding by Design, through-lines and provocations as provided through the Inquiry Model, the often quoted concept of learning intentions and success criteria or Chris Harte’s focus on skillsets, mindsets and toolsets. In addition to this, there is a difference in the language and complexity of an objective based on the intended audience, whether it be a class of preps or a group of adults. Just as objectives help define the why of learning, feedback helps to maintain this. According to Hattie and Timperley (2007) feedback is one of the most powerful influences on learning and achievement. The problem though is that this influence can be both good and bad. Only perfect practice makes perfect performance. If students don’t receive specific feedback in a timely manner, then they will keep doing their work incorrectly and reinforce bad habits. Keep the dollops—spoon-size portions—frequent and always targeted on the learning objective. 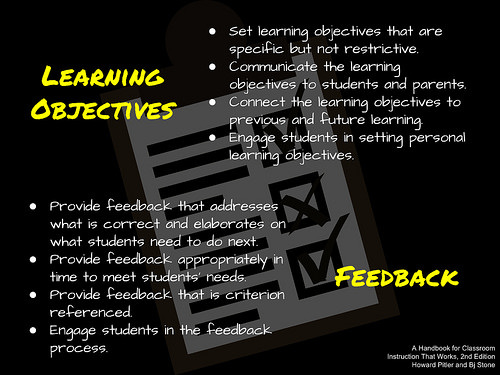 It needs to be said that just as objectives should not be dictated to students, feedback is not solely the responsibility of the teacher. For just as Steve Wheeler suggests that, “pedagogy is leading people to a place where they can learn for themselves,” feedback should support students with the skills to provide themselves and their peers with appropriate feedback. The most common form of feedback is through the use of rubrics. These help students identify when they have achieved a particular objective. It needs to be recognised that for some, such as Alfie Kohn, this supposed strength is in fact a rubrics biggest weakness. While Dean Shareski raises concerns about the use of exemplars as being restrictive, especially when it comes to creativity. One comprimise is to give students a voice in the creation of rubrics. The Buck Institute of Education provides a useful ‘Rubric for Rubrics‘ to help with this process. Some other strategies that can be used to support the feedback process include the creation of checklists, gallery walks, providing opportunity for critique and review, as well as using different visible thinking routines. Students know what they are supposed to be learning, have clear direction on how well they are progressing toward that learning objective, understand their role as learners, and have an engaging and interactive place to learn. So what about you? What has been your experience in regards to setting the why of the learning environment? As always, comments welcome. Creating the Environment for Learning – Objectives and Feedback by Aaron Davis is licensed under a Creative Commons Attribution-ShareAlike 4.0 International License.